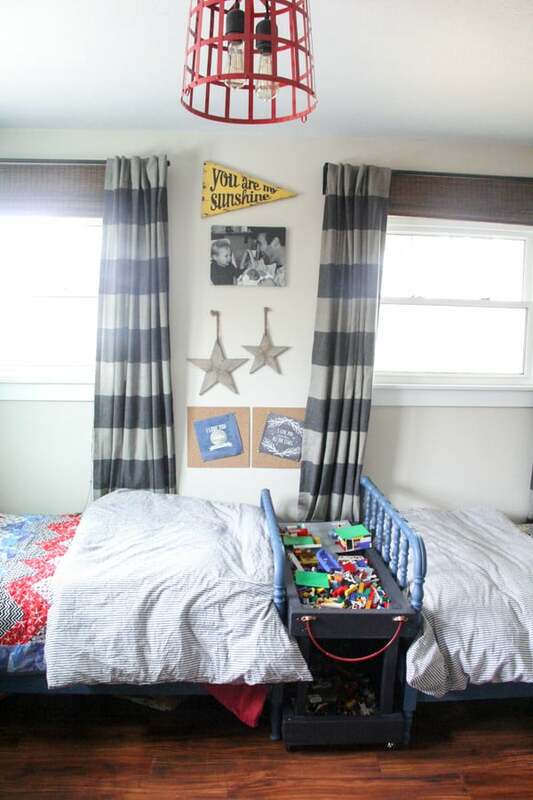 Recently I shared the shelving that I built for the boys room and how to use vintage decor in a kids room. 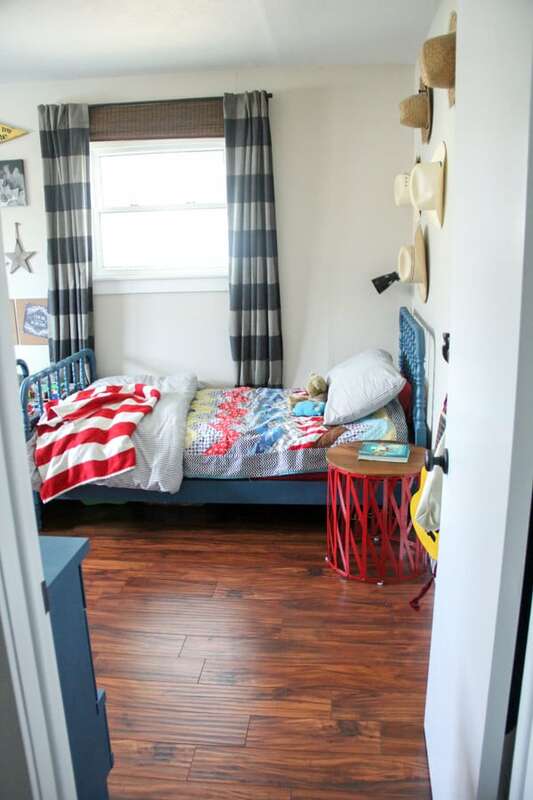 Today I want to share the entire reveal of their Vintage Modern Boys Room. I REALLY love this room! 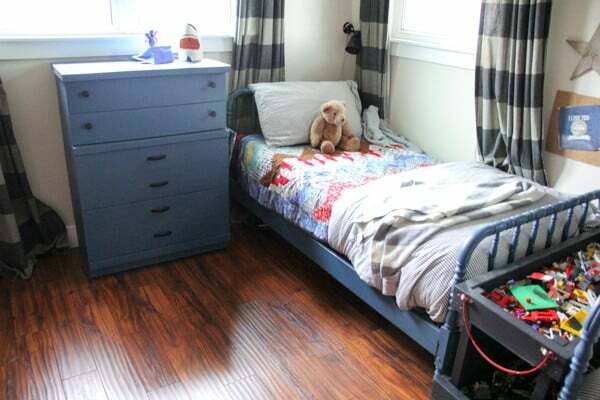 When we sold our last house and had to part with the loft bed we built them I was sad they’d never have such a special space again. Thankfully we’ve created a space JUST as special as the last! Walking into their room I wanted it to have an open feel with plenty of room to play. To accomplish this we pushed both beds against the far wall. Their beds are vintage Jenny Lind beds that I found at an auction and an antique store. I painted them with Annie Sloan Aubusson Blue Chalk Paint and clear wax. My mom found Mason’s red metal nightstand on clearance at Target and it works perfectly. The quilts on their beds are the pirate quilts that I made them, paired with simple striped Ikea duvet covers. 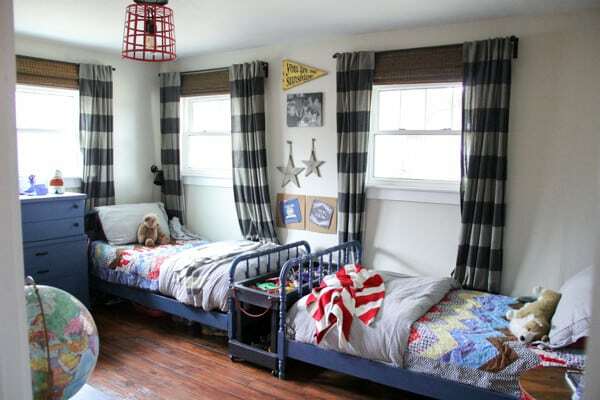 I love their West Elm striped curtains (which sadly are discontinued), but it was difficult to open and close them daily behind their beds, so I added these bamboo shades which work perfectly. 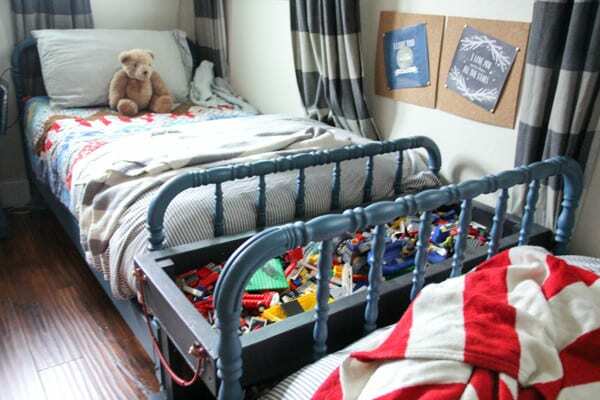 We built the rolling Lego tray to fit the space between their beds perfectly. Their red light is one I made from a metal basket! Of course I needed a mini-gallery wall to fill this little spot. The canvas is a picture of Jack meeting Mase for the first time in the hospital. 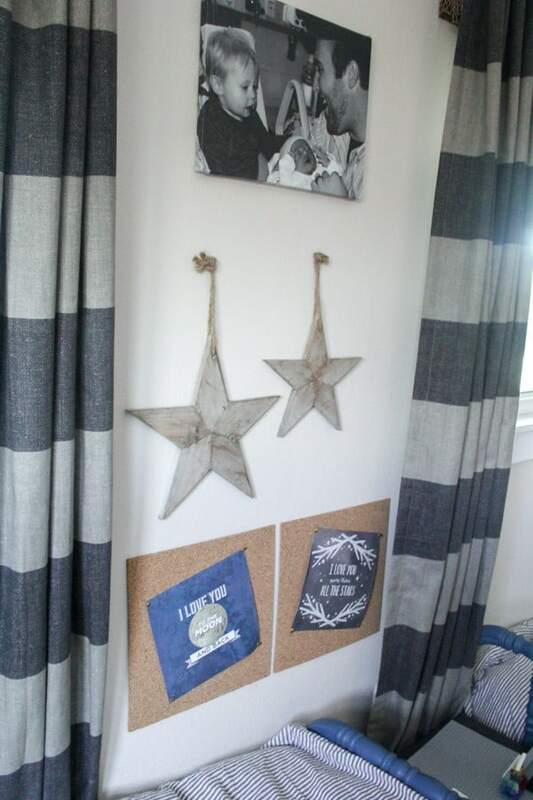 The printables on the cork board say, “I love you to the moon and back”, and “I love you more than all the stars”. These are SO fitting because every night we all go back and forth with “I love you more than…..”, it’s a sweet reminder of this nightly ritual. 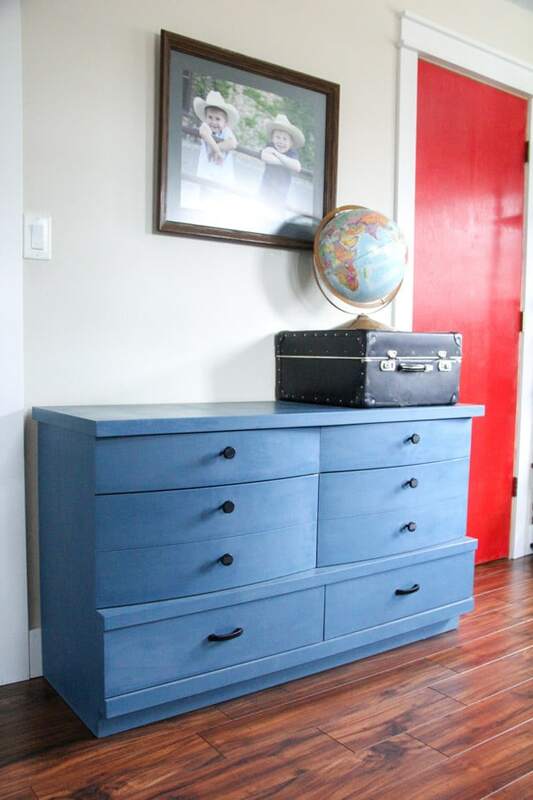 Over on Jack’s side I picked up this vintage dresser for only $5 at an auction! I painted it the same Aubusson blue as the beds. 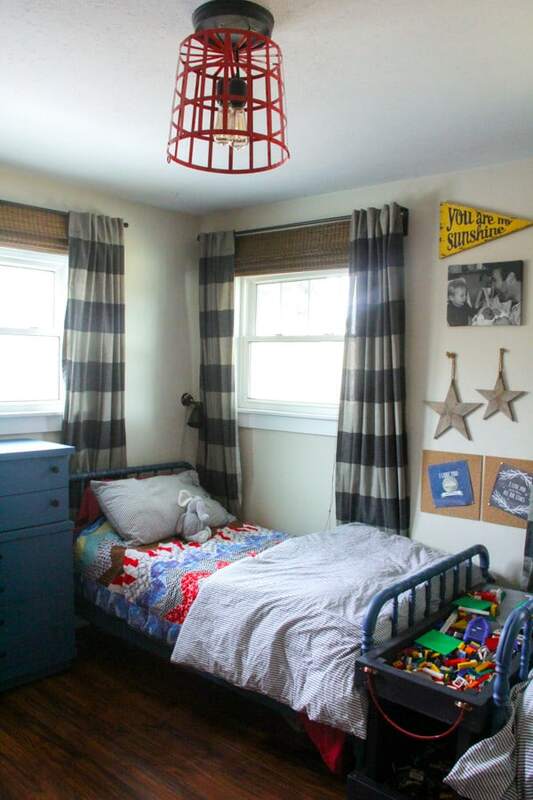 Both boys have reading lamps over their beds from Ikea. 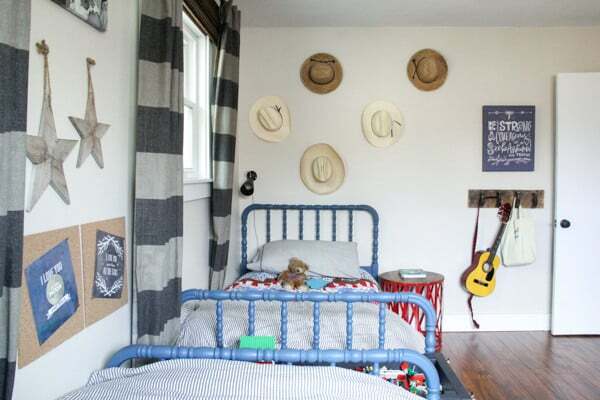 Looking back at Mason’s bed you can see his cowboy hat collection, which isn’t even all of them! Often at night I come in to find both boys at the foot of their beds huddled over their legos whispering back and forth. That relationship makes me so thankful that they share a room! Against the other wall is the other $5 auction dresser, along with the spindle shelf that I built them. Isn’t their red door adorable? 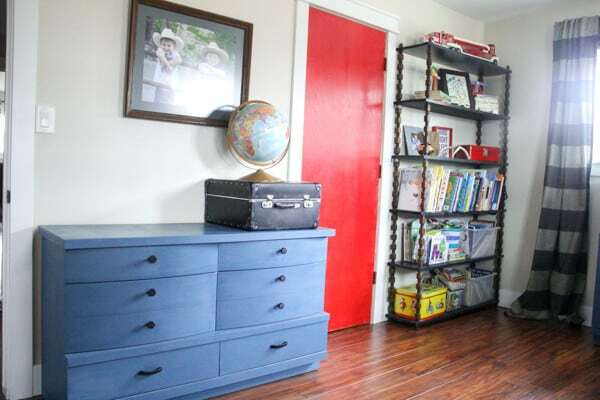 It’s crazy how just a few pops of red make this entire room so much more fun! 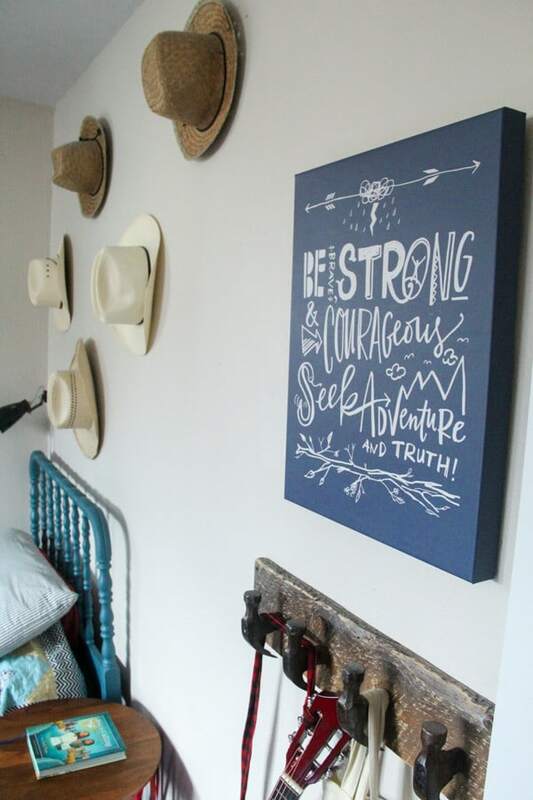 I picked up this Lindsey Letters print from Hobby Lobby and think that it is just meant to hang in a little boys room! Their hammer coat cook is from the same shop as one of the Jenny Lind beds in Buffalo, MN. Writing this post makes me just a little nostalgic about what a special time and age they are in right now. At 5 and 6 they are still such innocent little boys. It won’t be long until they’ve outgrown things like their pirate quilts and cowboy hat collection. For now I am just going to continue to relish it! 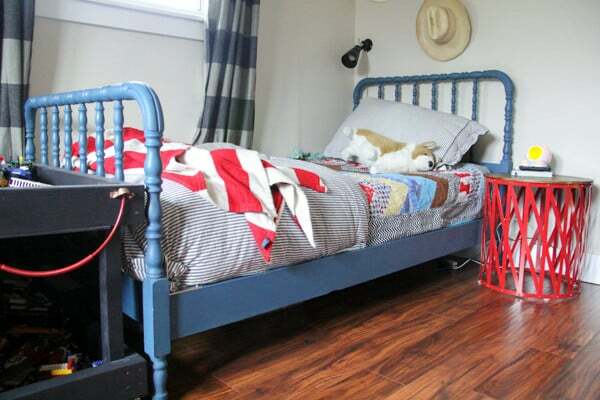 If you like their room, I’d love for you to check out the rest of the rooms on our home tour! LOVE it!! So cute, and you know I love all the little details!